Philippi township, Cape Town, is an extremely difficult place to grow up for the 25,000 youth who live there. Amandla Development is committed to supporting Philippi youth from cradle to career. They created and currently lead the Philippi Collective Network, a network of community-based organizations that all sign on to community goals and objectives. 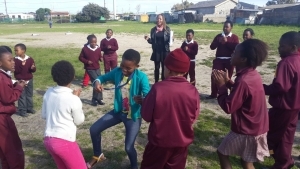 In an exciting venture into the collective impact space, CTAOP’s partnership aims to improve the accessibility of youth friendly health services, decrease the stigma around testing and openly pursuing one’s sexual health journey, and create more activities that draw youth to Amandla’s community space. This is a new venture into the collective impact space for CTAOP. If successful, there is potential to bring the collective impact model to scale in other communities through powerful collaborations with both funders and community-based organizations.